However after the corroboree some of the Wurundjeri decided to go on one last walkabout to Melbourne. Not having permission to leave the reserve they were arrested at Bulleen and sent to the Police Paddocks at Dandenong. 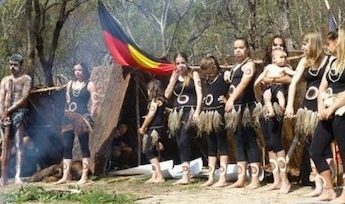 Others continued to live on creek-side encampments or work on local stations, while others moved to the safety of the Upper Goulburn until land was reserved for them at Coranderrk in 1863. Pound Bend served as a ration station until closed in 1862. Nillumbik Reconciliation Group, in partnership with Reconciliation Manningham, has erected plaques on two boundaries of the former reserve: at the confluences of Stony Creek and of Anderson Creek with the Yarra River. 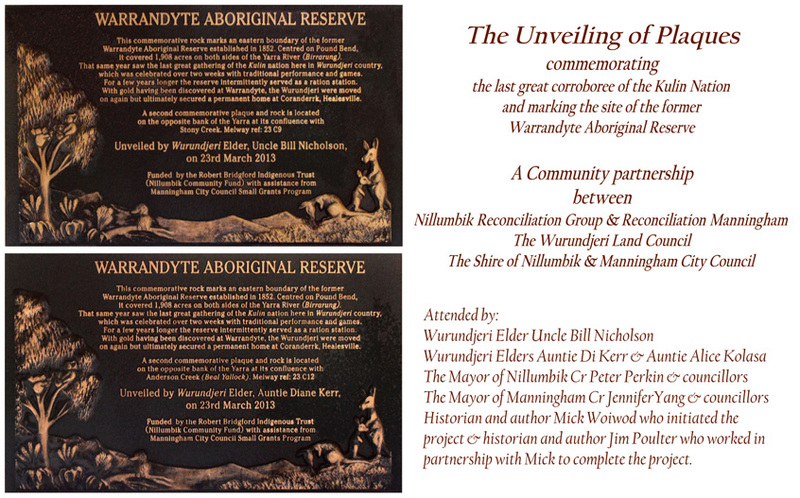 The plaques were unveiled on 23rd March 2014 during the Warrandyte Festival. You can download a flyer with more information and directions to the sites here. More extensive information on the plaques, historical notes on the Wurundjeri of the Yarra Valley, and sites of significance around Melbourne are included on a brochure that can be downloaded here.